The eyes are the windows to the soul, so it’s important to take extra special care of those windows! Because the eyes don’t lie, they can be the biggest tattletales of all when we’re exhausted, have aged, or fallen prey to sun damage. Luckily, there are a plethora of options out there to keep those peepers on point, from preventative care to damage reversing products. To help you clear the clutter, below are some handpicked eye care solutions to have you seeing the world through fresh eyes. Nope, not the pirate kind. Under-eye masks are what dreams are made of for those times in life you need an extra pick-me-up. They provide a surge of moisture, leaving eyes revitalized after exhaustion or neglect. ToGoSpa carries a variety of three-packs, or explore all the options at Macys.com to find your go-to brand. Use these in addition to your morning and nightly routine. Hollywood celebs don’t just wear big sunglasses to look cool, they’re shielding their moneymaker. 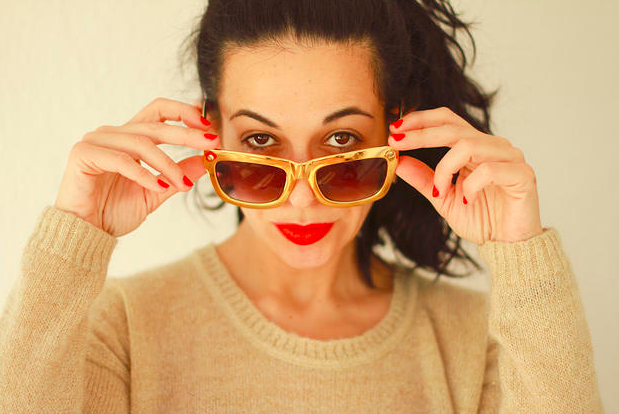 Sunglasses protect your retinas along with the delicate skin around your eyes that often reveal the first signs of aging. Choose glasses that cover your crows feet areas like these Versace polarized sunglasses. In addition to sunscreen and a hat, it’s the best thing you can do to preserve your face’s youthful appearance. I scream, you scream, we all scream for eye cream! Eye cream should be a part of everyone’s daytime and nighttime skincare routine. For the morning, I LOVE Clinique’s Pep-Start eye cream. It’s light enough to work with your sunscreen and foundation, but so effective that it feels like a big drink of water for the under eyes. It’s also totally affordable. For nighttime, The Estee Lauder collection is next level. Their Revitalizing Supreme+ Global Anti-Aging Cell Power Cream has a satiny touch that’s soothing to the eye, and it absorbs well so you don’t have that greasy feeling a lot of creams leave behind. Always remove eye makeup at the end of the day. Leaving mascara on while you sleep can harm your lashes, causing them to stiffen, and then break off with the risk of scratching your cornea. At the very least, the mascara will flake off and irritate your eyes. No bueno. Choose a quality cleanser that is effective, yet gentle like Clarins Instant Eye Makeup Remover Lotion. It’s tough on eye makeup but safe for those contact-lense wearers. If you’ve ever gotten sunscreen in your eyes, you know that a gentler option is a big bonus. Undereye sunscreen is overall more forgiving and offers the same protection for those delicate places around your eyes. 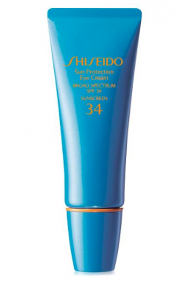 Try Shiseido Sun Protection Eye Cream to combat the UVA and UVB rays in addition to your facial sunscreen. Fake lashes look incredible and they’re the envy of everyone who doesn’t have them, but are they the safest option for your real lashes? Not really. Between the harsh glue, the application, and pealing them off, you’re not only making a mess, you’re doing a number on your real lashes. Keep the falsies for special occasions and enhance your current lashes with neuLash Lash Enhancing Serum. They give lashes a more luxurious, longer look in just 30 days. For those mornings you and your eyes don’t want to get out of bed, battle puffiness with Clinique’s All About Eyes Serum De-Puffing Eye Massage – it’s like a shot of espresso for your eyes. The cool rolling ball massages away under-eye puffiness along with a caffeine, botanicals, and antioxidant-infused serum. Eat your heart out Starbucks! When it’s time to walk out the door and face the elements, most of us like a little concealer under our eyes for that extra youthful boost. 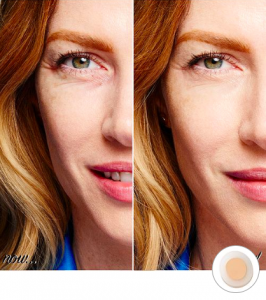 Instead of drying out your skin for the sake of beauty, why not work double duty with a concealer that moisturizes too? Benefit’s Boi-ing Hydrating Concealer does just that, offering six hours of hydration and a simple touch up applicator for those long days. It’s affordable and comes in a variety of skin tones. And while you’re taking care of those eyes, hop over to Sami’s, 5 Easy Steps to Summer Skin Care blog for some gems on overall skin care!